There's this old saying that reads "opportunity only knocks once". It may not necessarily be an opportunity that suits everyone or every situation but if it does come one needs to be ready as it will not stay around very long for it to be exploited. The following is a classic case for Sabah. Slightly more than a year ago a global player in solar PV industry pledged more than RM5 billion (USD1.7bil) to build a solar glass plant in KKIP, Sabah. That company is Sun Bear Solar Ltd of Hong Kong. That plan now, as far as I'm concerned, is as good as history. 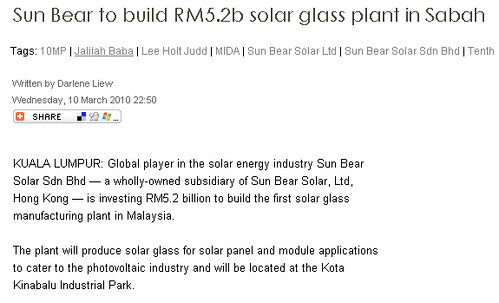 Sun Bear reviewed its position and realised that Sabah is incapable of providing one critical aspect of setting up a sophisticated production complex - POWER SUPPLY. Insufficient power supply means no manufacturing plant. You can't burn silica with the 'heat' generated from you domestic bickering, can you? While we were busy debating how we should come up with sufficient power supply for the people in the East Coast, and while people argued on the viability of the Lahad Datu Coal-fired power plant, an opportunity to learn first-hand new technology, and to provide jobs for the locals evaporates in a blink of an eye just like mist in a dry morning. Fine. There'll always be another chance, you say. A couple of days ago, US-based Solexel pledged to invest RM2.8 billion to build a photovoltaic cell manufacturing plant in Senai Hi-Tech Park in Johor. Sun Bear initially picked Sabah simply because of the abundant supply of silica here, especially the Northern part of our state. Do you think Solexel would even consider Sabah anymore? "Sorry Sabah, you are too engrossed with your domestic problem and you are unwilling to accommodate to our fundamental need. Thanks, but no thanks. We'll do business elsewhere for now." I'd very much like to blame someone else for the opportunity loss, really. But how and why? It is obviously our fault and ultimately it's our loss. As the leaders of the day, you've got to feel guilty, even if it was just for the slightest of your conscience. Your mighty hands failed to create opportunity for the eager youth to acquire new knowledge, earn decent income, and be proud members of a community of highly skilled human capital. Come on now! Bring on Kimanis Petronas Power, Lahad Datu Thermal power and Banggi solar farm!